Most present-day large galaxies are spirals, presenting a disc surrounding a central bulge. Famous examples are our own Milky Way or the Andromeda Galaxy. When and how did these spiral galaxies form? Why do a great majority of them present a massive central bulge? An international team of astronomers  presents new convincing answers to these fundamental questions. For this, they rely on an extensive dataset of observations of galaxies taken with several space- and ground-based telescopes. In particular, they used over a two-year period, several instruments on ESO's Very Large Telescope. 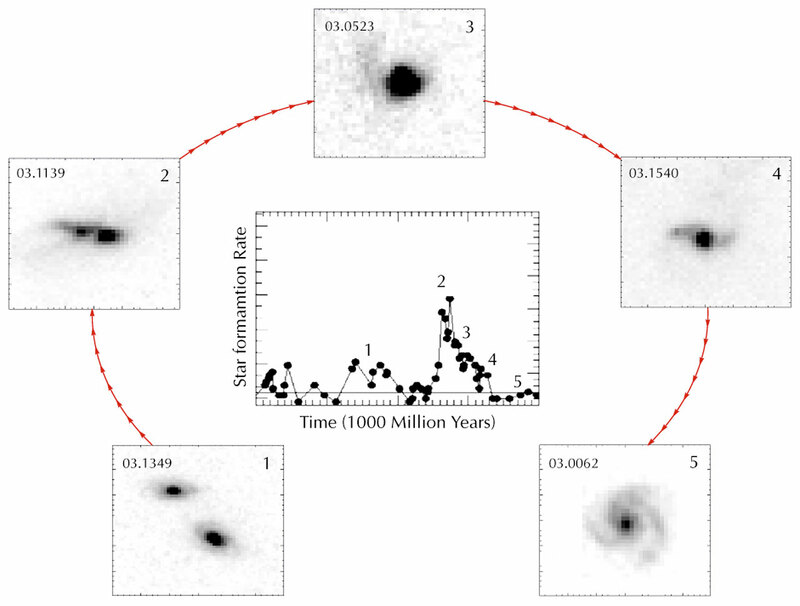 Among others, their observations reveal that roughly half of the present-day stars were formed in the period between 8,000 million and 4,000 million years ago, mostly in episodic burst of intense star formation occurring in Luminous Infrared Galaxies. From this and other evidence, the astronomers devised an innovative scenario, dubbed the "spiral rebuilding". They claim that most present-day spiral galaxies are the results of one or several merger events. If confirmed, this new scenario could revolutionise the way astronomers think galaxies formed. For this, they embarked on an ambitious long-term study at various wavelengths of 195 galaxies with a redshift  greater than 0.4, i.e. located more than 4000 million light-years away. These galaxies were studied using ESO's Very Large Telescope, as well as the NASA/ESA Hubble Space Telescope, the ESA Infrared Space Observatory (ISO) satellite and the NRAO Very Large Array. As François Hammer (Paris Observatory, France), leader of the team, states: "We are thus led to the conclusion that during the time span from roughly 8,000 million to 4,000 million years ago, intermediate mass galaxies converted about half of their total mass into stars. Moreover, this star formation must have taken place in very intense bursts when galaxies were emitting huge amount of infrared radiation and appeared as LIRGs." Another result could be secured using the spectra obtained with the Very Large Telescope: the astronomers measured the chemical abundances in several of the observed galaxies (ESO Press Photo eso0502). 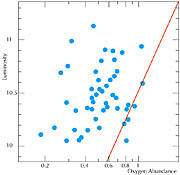 They find that galaxies with large redshifts show oxygen abundances two times lower than present-day spirals. As it is stars which produce oxygen in a galaxy, this again gives support to the fact that these galaxies have been actively forming stars in the period between 8,000 and 4,000 million years ago. The story revealed by these observations is in agreement with the so-called "hierarchical merging of galaxies" scenario, present in the literature since about 20 years. According to this model, small galaxies merge to build larger ones. As François Hammer however points out: "In the current scenario, it was usually assumed that galaxy merging almost ceased 8,000 million years ago. Our complete set of observations show that this is far from being the case. In the following 4,000 million years, galaxies still merged to form the large spirals we observe in the local Universe." To account for all these properties, the astronomers thus devised a new galaxy formation scenario, comprising three major phases: a merger event, a compact galaxy phase and a "growth of the disc" phase (see ESO Press Photo eso0502). Because of the unique aspects of this scenario, where big galaxies get first disrupted by a major collision to be born again later as a present-day spiral galaxy, the astronomers rather logically dubbed their evolutionary sequence, the "spiral galaxy rebuilding". : The team is composed of François Hammer and Hector Flores (Observatoire de Paris, Meudon, France), David Elbaz (CEA Saclay, France), Xian-Zhong Zheng (Observatoire de Paris, Meudon, France and Max-Planck Instiut für Astronomie, Germany), Yan-Chun Liang (Observatoire de Paris, Meudon, France and National Astronomical Observatories, China) and Catherine Cesarsky (ESO, Garching, Germany). 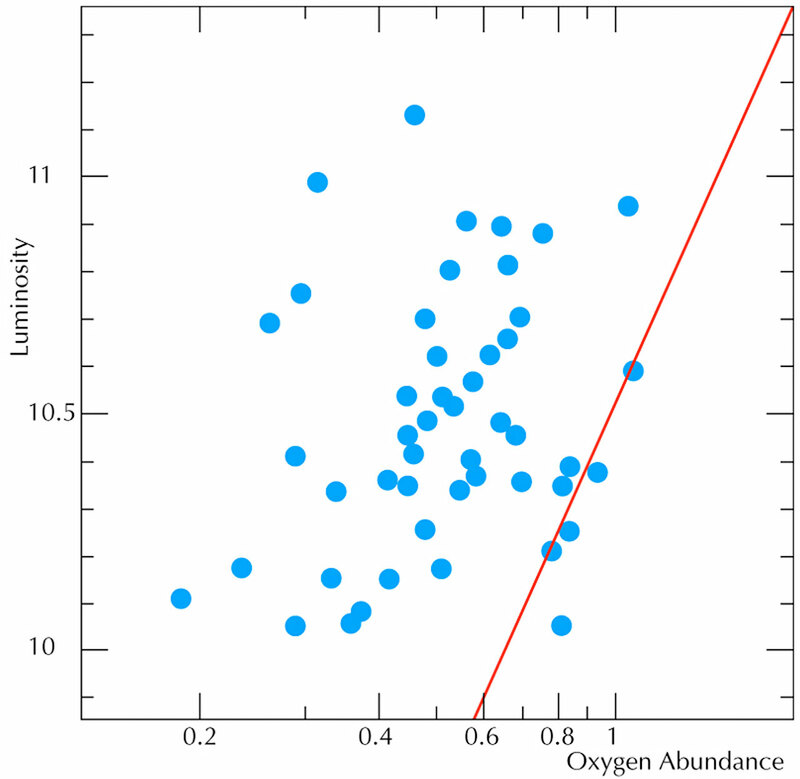 The research presented in this Press Release has been published in the leading astronomical journal Astronomy and Astrophysics, vol. 430(1). The paper ("Did most present-day spirals form during the last 8 Gyrs? - A formation history with violent episodes revealed by panchromatic observations" by F. Hammer et al.) is available in PDF format from the A&A web site.